Our grand kids have loved the computer adventure stories that are strong on colorful storybook graphics, tinkling sound effects, simple controls, and do not have any voice or text narration. 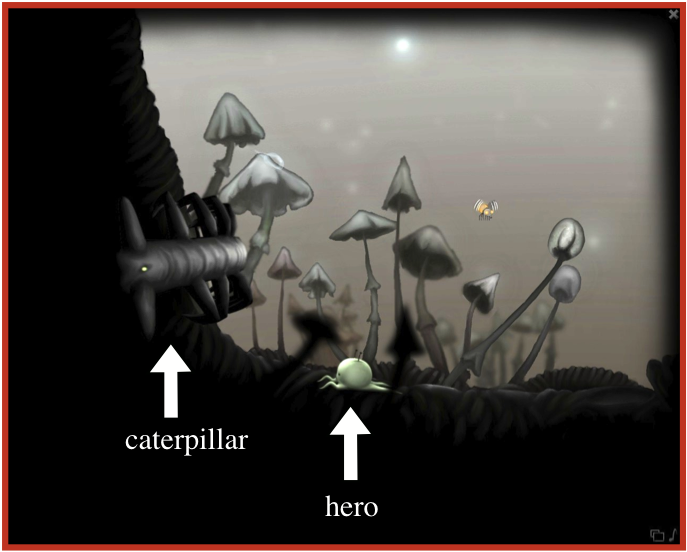 This style of story telling allows the player’s imagination to take a role in developing the details of the story. I’ve reviewed several of these games and a list appears at the end of this post. Now, on to The Old Tree. First, since there is no narrative other than the action on the screen, when you click on the red light on the opening screen, a creature is revealed. It’s a light-green bulb with four legs (or tentacles). Some have called the creature a space alien but I perceived it as a seed that is looking for a fertile place to grow. That’s the power of these types of computer games. You decide the details! One of the first challenges our hero meets is a caterpillar that parks itself over the hole that is the entrance to the tree. A bee, drops of water, and a flexible flower stem are the tools available to our hero. The clever use of these tools (by clicking on them) will chase away the caterpillar. 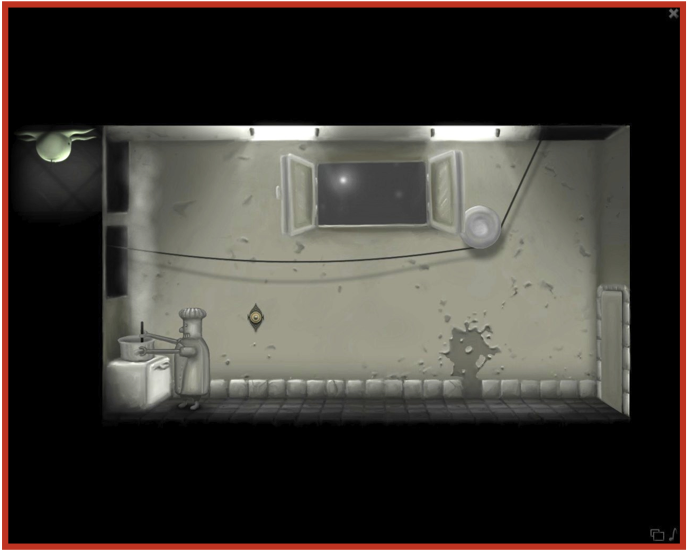 After successfully solving a few problems, our hero, upon leaving the previous room clinging to the ceiling, enters a kitchen where another unnamed character is boiling water for a stew. Unfortunately, the ingredients for the stew aren’t there. Ah! There’s a button on the wall. 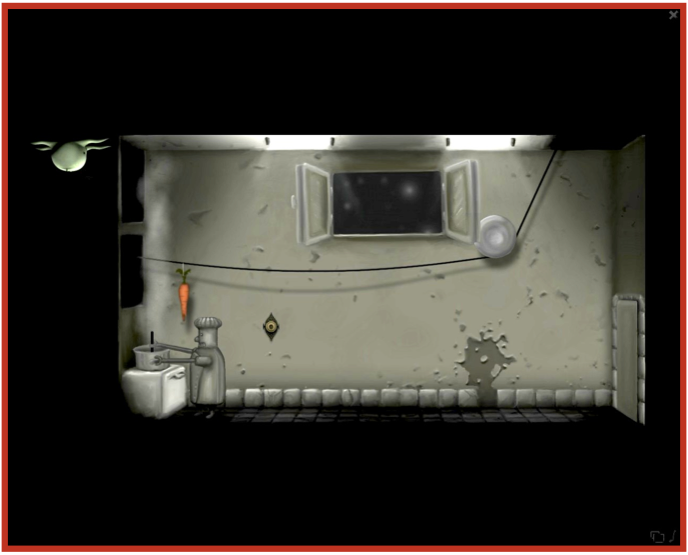 Press it and a carrot is transported into the room. But look out, if you are not quick, a critter will steal it! Unlike the other creative games I’ve reviewed, this one is short. After about thirty minutes of play, you reach the end of the tale and wave goodbye to the hero. Here’s a list of creative computer games with great stories that kids will enjoy.